Pyonex conditioner is an easy to apply coat-hydrating solution that aids in the treatment and prevention of superficial dermatitis and skin infections in dogs. A non-toxic solution, it does not cause any irritation to the pet’s skin. Used in conjunction with an anti bacterial shampoo this medicated conditioner remains effective for 14 days. Formulated specifically for dogs skin, this conditioner prevents infections and maintains healthy coat in all breeds of dogs. 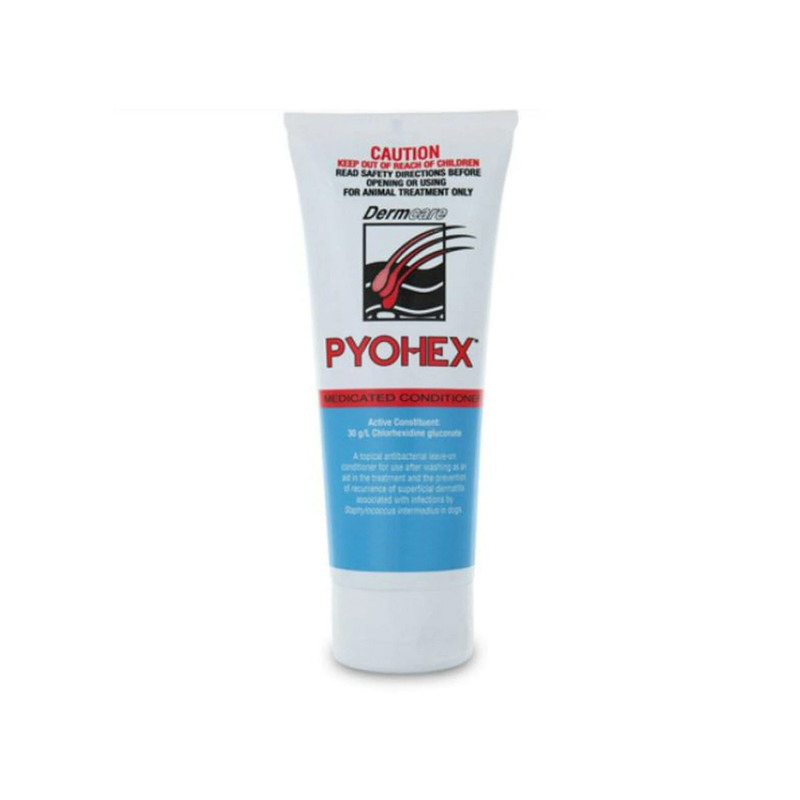 Chlorhexidine Gluconate is the active ingredient of Pyonex conditioner. It binds with the hair to destroy bacteria lying on the skin. It kills bacteria by disrupting the cell membrane and precipitating cell contents. With clinically proven antibacterial properties, this ingredient kills, controls and prevents gram positive and gram negative bacteria. With a 14 days residual activity period, the conditioner keeps the pet’s coat healthy. With a neutral pH, this one works well for canine skin. The conditioner should be used in conjunction with an effective antibacterial shampoo. Use it after shampooing the pet. To apply, take small amount of the conditioner on your palm. Spread it evenly on your palm. Now, gently massage the pet’s damp coat with your hands. Cover the entire body. Use 1ml of Pyonex conditioner per kilogram of bodyweight of the pet. Do not rinse or wipe the coat after application. Consult a vet for the frequency of usage. The conditioner shows a high margin of safety. It works well on puppies, adult and ageing dogs without any issues. Keep away from the pet’s eyes. conditions my dog, Loyla's fur amazingly and very effective against bacteria. My doggy was suffering from superficial dermatitis. This product prevented it. The great thing is that it does not cause any irritation to my doggy's skin. A great product!!! My dog was suffering from dermatitis and skin infection. But after applying this conditioner not only did the dermatitis got away, but the skin has become better with time. The great thing is that this product is effective for 2 full weeks and also maintains a healthy coat of my furry pal. Thank you so much!! !